Already own a home in the Bon Secour View subdivision? Thinking of selling? Click here and read about current search trends & our web network. 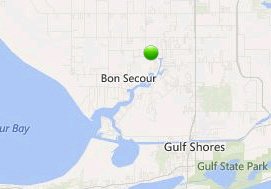 Bon Secour View subdivision is located in the Foley, AL area near Bon Secour Bay. Homes for sale in Bon Secour view are listed below along with helpful sales info like current listings, property details, pictures and an interactive Google map. This area of Bon Secour also has other inland waterways that feed in to Oyster Bay and Bon Secour Bay, like Fish River and Magnolia River. Bon Secour view is approximately 10 - 15 minutes from downtown Foley, AL and only about 20 minutes from the public beaches and the Gulf Shores Hangout and the same distance from downtown Fairhope. Please let us know if you would like additional info such as, pictures, subdivision bylaws, recent sales figures by emailing info@condoinvestment.com or call (251) Area-Pro (251-273-2776) for immediate assistance or to schedule appointments to view current listings in Bon Secour View or other properties in the area.